The court in its order said Sadhvi Pragya cannot be exonerated of conspiracy charges as she was aware about the motorcycle being used in the conspiracy. 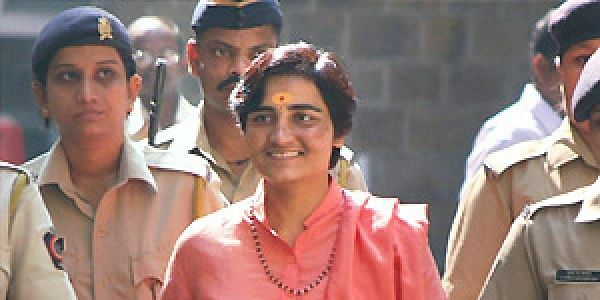 MUMBAI: The special NIA court on Wednesday dropped all charges under the stringent Maharashtra Control of Organised Crime Act (MCOCA) against Sadhvi Pragya Singh Thakur, Lt Colonel Prasad Shrikant Purohit, Ramesh Upadhyay, Sameer Kulkarni and Sudhakar Dwivedi in the 2008 Malegaon blast case. The court also discharged three other accused — Shyam Sahu, Shivnarayan Kalsangra and Praveen Takalki. The court, however, made it clear that both Sadhvi Pragya and Purohit, along with six other accused, would face trial for terror and conspiracy charges. The NIA, while filing a chargesheet in the case last year, had given a clean chit to Sadhvi Pragya, Sahu, Takalki and Kalsangra, saying it found no evidence against them. The special NIA court on Wednesday dropped all charges under stringent Maharashtra Control of Organised Crime Act (MCOCA) against Sadhvi Pragya Singh Thakur, Lt Colonel Prasad Shrikant Purohit, Ramesh Upadhyay, Sameer Kulkarni and Sudhakar Dwivedi in the 2008 Malegaon blast case. The court also discharged three other accused – Shyam Sahu, Shivnarayan Kalsangra and Praveen Takalki. The court, however, made it clear that both Sadhvi Pragya and Purohit, along with six other accused, would face trial for terror and conspiracy charges. They would be tried under Sections 120 B, 302, 307, 304, 326, 427 153 A of Indian Penal Code (IPC), along with Sections 16 and 18 of the Unlawful Activities (Prevention) Act . Two other accused, Rakesh Dhawde and Jagdish Mhatre, would face trial only under the Arms Act. All the accused are already out on bail. Their previous bonds and sureties will continue. The next hearing in the case is on January 15. Special judge S D Tekale was hearing the pleas filed by seven of the 13 accused and the NIA’s application seeking framing of charges. The court in its order said Sadhvi Pragya cannot be exonerated of conspiracy charges as she was aware about the motorcycle being used in the conspiracy. The NIA, while filing a charge sheet in the case last year, had given a clean chit to Sadhvi Pragya, Sahu, Takalki and Kalsangra, saying it found no evidence against them. The court had on Monday dismissed pleas filed by Purohit and Sameer Kulkarni, challenging their prosecution. Speaking to The New Indian Express, advocate Prashant Magoo, who represents Sadhvi Pragya and four others, welcomed the decision and claimed that “the whole case has crumbled”. “Four of the five accused I have been representing have been discharged. This (MCOCA) was the main charge and once it has been proven wrong, nothing much is left in the case.” he added.